Meet Froggy. He's an amphibian on the run from a crazy chef who is trying to make a frog legs dinner. It's your job to get Froggy to safety and away from the saucepan. This mission isn't easy, however, because Froggy is one of the few frogs in the world that cannot swim. 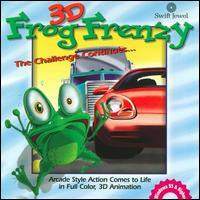 With Froggy's fear of water in mind, you must help him escape by hopping through highways while trying to avoid traffic, traveling across rivers on logs and getting to the portal that leads to the next level. Did I mention there's a timer? If time runs out, so does Froggy's luck. During Froggy's adventures, he will encounter items that can enhance or hinder his performance. Colored gems fall from the sky with the following properties: Extra Time (adds time to the level timer), Freeze (stops cars and logs for a few seconds), Heavy Traffic (increases traffic flow) and Haste (Froggy quick mode). Other qualities contained in gems are Mystery (random power-up or power-down), Points (player bonus points), Slow (opposite of Haste) and Walk on Water (a few seconds respite from drowning). It features 3D graphics and twenty different levels.